We love love love IKEA . 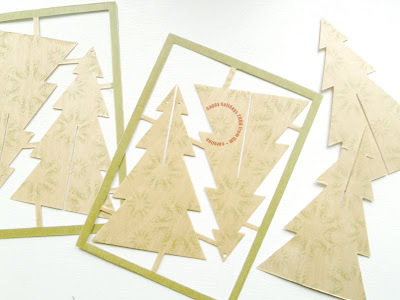 . . so much that we themed our christmas cards on it's iconic branding. In the way of a little backstory, you should know that our favorite date spot as teenagers was the IKEA showroom floor, where we'd stroll around pointing out which pieces we liked and didn't. We sat down for long talks in the set-up rooms like it was our own place and we endured sideways glances from employees and fellow shoppers when we flopped over the couches with our legs over the arms at either end and our heads togther in the middle. When I left for college, he'd call me up and over the phone we'd pour over our catalogs, he in Virginia and me in my dorm room in Philly. "Turn to page 87," he'd say "do you think the EKTORP chair goes with the couch that we liked?" We celebrated Valentine's day with $1.99 breakfast in Philly's IKEA my senior year of college. We know the rules of the AS IS area by heart and we've tasted all of the Market Place's swedish food offerings. In search of a much desired piece we once traveled to five IKEA stores in one day - and that's no easy feat considering there are just 37 stores in the Continental United States! 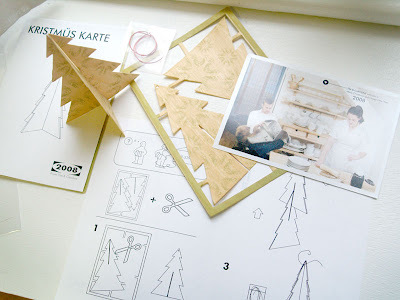 Here's the big idea for our card: flat-packed real wood tannenbaums for all our friends and family, complete with assembly instructions and a catalog-shot of us in our kitchen. We included a bit of string for hanging the assembled tree. After moving into our Apartment and reflooring it with none other then IKEA laminate flooring we began choosing pieces for around the house. Generally refering to our furniture pieces by their original IKEA names after assembling them, the names sort of stuck, so now when Tim asks "Where did you leave the car keys?" I reply "They're right on the DIKTAD, where they belong!" and the piece where we store the dishes (you can see it in the catalog photo of us.) In the middle of prepping a tasty dinner Tim will blurt "Sweetie can you grab me two bowls off the FORHOJA*, please?" Needless to say, we're very familiar with the IKEA naming system, so ofcourse choosing the name for the card was a much anticipated task. Karte is actually swedish for card so that was an easy swap and then a tricky spelling phonetic-sounding swap-out for Christmas with obligatory umlauts, completed the name. We STILL have this card on our fridge--kewlest Karte we ever received, bar none! But have you sent one to IKEA? I think you should!